The Day of the Dead is not at all like Halloween. The two days that comprise the Day of the Dead celebration are actually public holidays in Mexico. It is not surprising, then, that since a significant number of people from Mexico and with ancestors from Mexico live in Arizona, that it is a popular celebration here. The Day of the Dead is a ritual the indigenous people of Mexico have been practicing for more than 3,000 years. It is still celebrated in Mexico as well as certain parts of the United States and Central America. Native Aztecs and other Meso-American civilizations viewed death as the continuation of life rather than the end. In the United States and certain parts of Mexico, it is traditional for families to build in-home altars dedicated to the dead. They place flowers, food, pictures of the deceased and lighted candles around the altars. Many Valley cities host Day of the Dead celebrations each year on the first two days of November. People will sometimes don wooden skull masks and dance to honor deceased loved ones. The wooden skulls, or calacas, are also placed on altars. A relative or a friend often eats sugar skulls, bearing the name of the dead person on the forehead. Check the calendar for the Phoenix Public Libraries for crafts, alter displays and other special activities relating to El D&iacute;a de los Muertos. The altars are original pieces specifically created for this celebration by local artists. Included with garden admission. Desert Botanical Garden, Phoenix. An artist Mercado held toward the end of October showcasing an assortment of traditional and contemporary merchandise, jewelry, and arts and crafts. 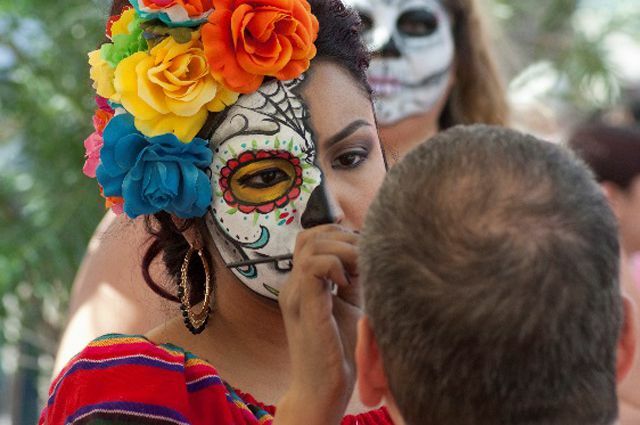 Live artist demonstrations, live traditional music and dance, sugar skull making. Procession and community altar. Free admission. Mesa Arts Center. Day of the Dead bread is offered at more than 40 Food City bakeries across Arizona. This eerie, creative looking bread is being sold in family-size packages at Food City stores toward the end of October.